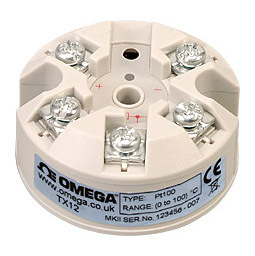 The TX12 head mounted temperature transmitter connects to any standard pt100 resistance sensor and converts the linearized temperature to a 4 to 20 mA signal. The transmitter is a two wire device, and is fully configurable by the user, over a wide temperature range, with the aid of a simple push button. This new TX12 design incorporates additional configuration menus, allowing the user to push button trim the transmitter output at both zero and span, ideal for trimming out sensor errors. The transmitters advanced circuitry guaranties high stability over the wide operating ambient temperature ranges experienced by head mounted devices. One of the transmitters features is the program LED, which provides visual indication of sensor fault when in normal operation and is also used to guide the operator through the simple menus during configuration. Note: Sensor input wires to be less than 3 m to comply.